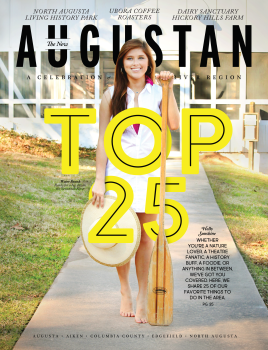 Think you know the real Augusta? We have some surprises in store for you. Augusta is a historic city with a fresh new vibe. Yes, we’re tradition, we’re golf, we’re azaleas and manicured lawns. We’re also funky music, cutting-edge art and improv theater. We’re family festivals, outdoor fun and quirky bistros. We’re art and music and history and kayaking and baseball. We’re more than you ever imagined. There are lots of ways to get to the heart of Augusta. Learn where old meets new and tradition meets tomorrow. Come take a walk along our tree-lined streets, stroll along the Savannah River or see the city from the water. You’ll learn a lot about us through our food, from traditional Southern cuisine to New American, regional fare as you take your time over dishes that are down home or high style. We have fair weather most of the year, so it’s easy to get out and play. Take advantage of the long, lazy summers to explore the Augusta Canal National Heritage Area or the trails and views along the Riverwalk. We have nice neighbors who share our love of the outdoors, so be sure to check out the F.A.T.S. mountain bike trails, lakes and parks that meander from Georgia to South Carolina and back again. Visit our history museums and preserved sites to learn about the famous figures and everyday people who helped shape our past. Visit historic downtown Augusta to see how the past is giving way to a future of innovative art, music and performance.